Our blog today is by dancer Kyle Johnson, who carries Julianne Gearhart (Amour) on his shoulder in the final moments of Orphée et Eurydice. Photo, left, by Elise Bakketun. 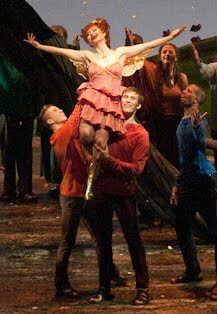 When I auditioned to dance in Seattle Opera’s Don Quichotte last season, I never imagined the adventure I would have with the company over the next year. I have had the privilege of dancing in three different productions, with three different choreographers, first in Don Quichotte and then in this season’s productions of Carmen and Orphée et Eurydice. From the studio to the stage, each opera was a unique experience. 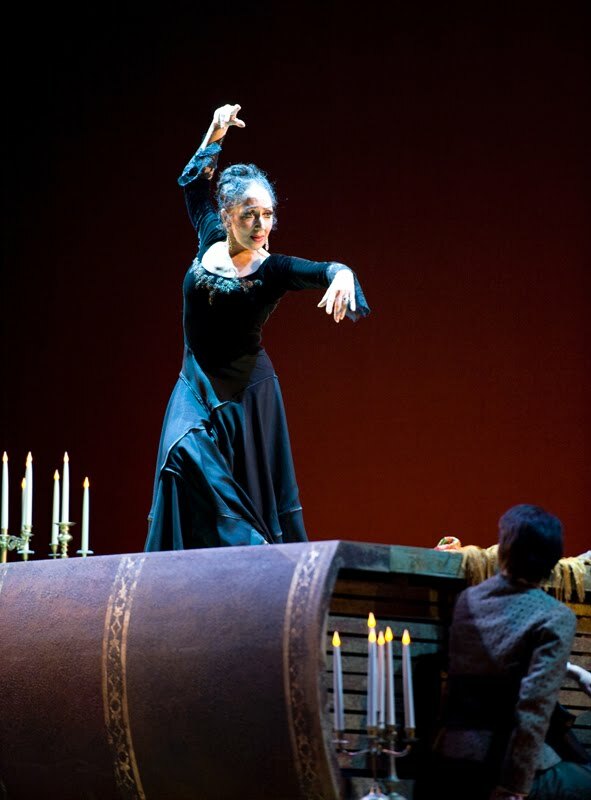 Last season’s Don Quichotte brought the pleasure of working with the acclaimed Spanish choreographer Sara de Luis, one of the leading experts in Classical Spanish Dance. This style was a whole new skill for me, and it was such an amazing experience to learn it from Sara. Sara de Luis in Don Quichotte. Having never choreographed this particular opera before, Sara was not only teaching the dancers a new way of moving, but creating a brand new original choreography for us. 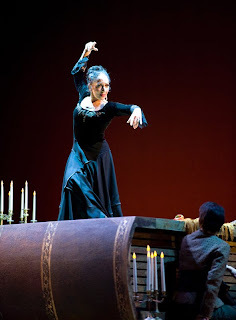 She collaborated with director Linda Brovsky, who had a clear vision of the dancers' place in the opera. Linda didn’t want the dancers to be a novelty act, but really to be incorporated into the action. So rather than coming forward and performing to the audience, Sara had us facing into the crowd onstage, performing for the chorus or the principal artists. So the dancers really became a part of the story. We were street performers, gypsies, and friends to the characters of the opera. Kyle Johnson (far right), with Principal Dancer and Choreographer Sara de Luis in last season's Don Quichotte. This season’s Carmen was a very different experience. 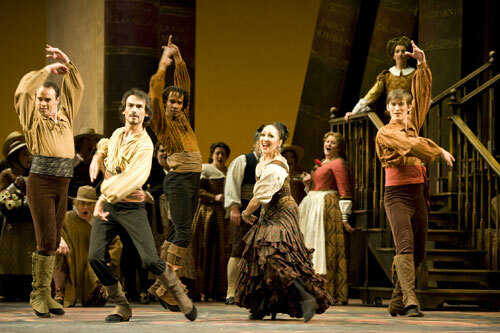 Although Carmen, like Don Quixote, is a Spanish-themed opera rather than traditional Spanish dance, the dancing was far more theatrical, with Spanish accents flavoring the choreography. Choreographer Peggy Hickey, who regularly choreographs for opera, musical theater, and television, had choreographed Carmen many times before, so we were for the most part staging her existing choreography. Peggy had also collaborated with director Bernard Uzan on a previous production of Carmen, and it showed in the final product: a cohesive, polished opera. The dancing in this production was far more grandiose than in Don Quixote last season (including a dream ballet prior to Act 4) but didn’t distract from the action on stage; it added another layer to the overall picture, and was a pleasure to dance. 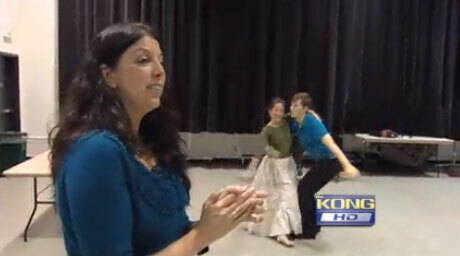 Carmen Choreographer Peggy Hickey (with Kyle Johnson dancing in the background) during a rehearsal filmed for a KING 5 HealthLink segment (click here to watch). Orpheus and Eurydice, which is currently on stage at McCaw Hall, has been an entirely different process. A completely different style of opera, and a completely different style of dance. Choreographer Yannis Andoniou comes from a background of ballet and contemporary dance, having performed for years with Alonzo King’s Lines Ballet. He is also no stranger to opera, having danced for 15 seasons with the San Francisco Opera. And he’s intimately acquainted with Orpheus and Eurydice, having collaborated with director Jose Maria Condemi on a past production. But rather than restaging the choreography from that production, Yannis created brand new movement for the brand new dancers in this production. Yannis and Jose Maria have mutual respect for each other’s process, and Yannis created movement to suit Jose Maria’s vision for the opera: that the dance should propel the story forward, rather than be a separate spectacle. 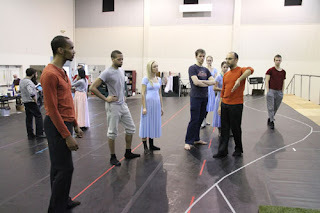 The dancers play many characters throughout the opera, but each character is key in the development of the story. As Villagers, Furies and Spirits, it is our job to lead Orpheus and Eurydice through their journey. Dancers for Orphée et Eurydice work with choreographer Yannis Adoniou (right, in orange) during rehearsals. For each of these operas, it was the choreographer’s job to make sure the dance never pulled focus from the story, but moved the story forward instead. Each choreographer brought something new and fresh to their respective productions. And I have learned so much from each of them. It has been such a pleasure working with each of these choreographers, and having the opportunity to work with the prestigious Seattle Opera. Until last year, I had always considered dancing in opera to be more history than present day, but over the past year I have learned that it is alive and well. Dance still has a place in opera today, and these productions have each demonstrated that to great effect. I’m so glad that I could take part in it. 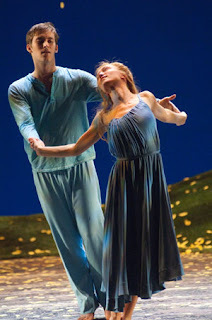 Kyle Johnson and Kate Chamberlin dance in Seattle Opera's Orphée et Eurydice. just commenting to make you know what an awesome experience my friend's child gained browsing your web site. She figured out too many things, including how it is like to possess a marvelous coaching mood to have others quite simply know just exactly certain advanced topics. You really exceeded our expected results. If you choose Custom essay to provide you with the writing help you have been looking for also get the result in many times I appreciate you for churning out those powerful, trustworthy, educational not to mention unique tips on the topic to Janet.